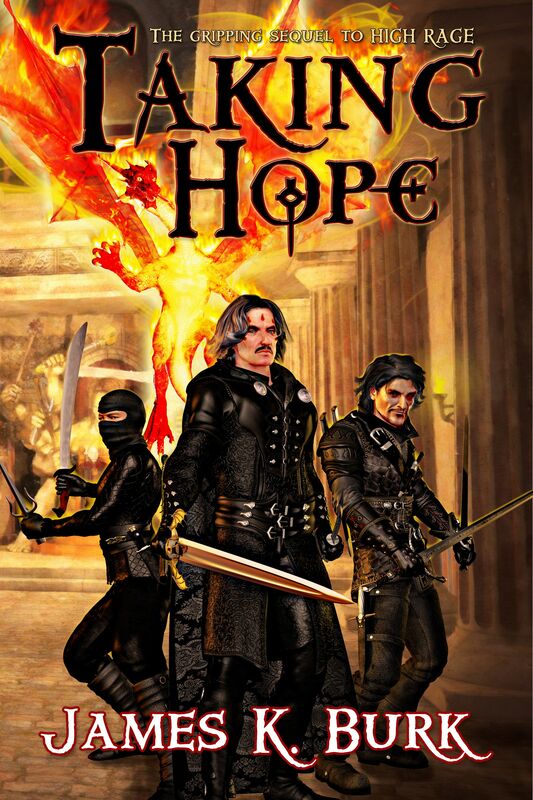 As with its precursor High Rage, it’s a little hard to describe the plot of Taking Hope. OK, at one level it’s easy: Morgan (aka Scarface) has decided that he will no longer be king, lives like a simple man and starts a family. One of the orphans he left behind in his former kingdom calls him back because between the deal he had struck with the god of war and his so-called son, his kingdom is being destroyed. The people he used to rule are suffering. Morgan decides to enlist the god of peace in his cause (because you need a god to defeat a god) and, along the way, rediscovers an ancient spell, reunites with members of his Clan family, gets his brother to truly live again and faces a woman he thought he loved but who betrayed him terribly. And when it’s all over, Morgan gets to go home. So in one sense, Taking Hope is pretty standard fantasy fare. In another sense though it really isn’t. Because in another sense this book is a pretty good commentary on human nature. There is, for example, the astute observation that people can’t just fight against something; they need to fight for something. Or there is the bit where James Burk.. shows us (and that’s all I can say without giving away the story) that you need to burn off your anger when it engulfs you. And, once you have burned it off; once you’ve cooled down you need to get on with your life. Don’t mope about; get on with it. Given how much he packs into Taking Hope, it’s not surprising that (especially in the chapter where Morgan tries to persuade the god of peace to come over to his side) James Burk gets a little philosophical. It does slow the plot and the character development down some though the insights are good. Still, I thought that chapter could have used a bit more editing. Other than that though, this is a well-written book. A good story that, at one level, is standard fantasy and, at another, is the story of a man who comes to live in peace with himself and his world. I recommend it.